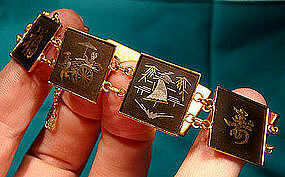 An attractive gold plated signed AMITA JAPAN komai 6-1/2" bracelet. This bracelet is done in the Komai damascening technique in which gold, copper and silver are inlaid into etched grooves on black oxidized metal backings. This 3/4" wide bracelet features Chinese characters, scenes of buildings, a dragon, bamboo, a boat and a rickshaw with rider; it has a box clasp and it is in excellent original condition with no chips, cracks, dents, bends, corrosion, losses, damage or repairs. All items are thoroughly and conservatively graded and all condition issues are noted; all items are secondhand and may have slight signs of gentle use. Tracked packet air insured shipping to the U.S. starts at $13.50 (other spots may vary). Items paid with a credit card will be shipped to confirmed addresses only. We do ship internationally. All of our prices are in $US. NOTE: we do not accept PayPal.